I crunched some numbers today. Kind of depressing. I have 12 short-boxes of comics in my “unread” section….I also have that stack pictured above of trade-paperbacks/hardcovers. I buy new stuff mostly as TPBs/HCs while I’m collecting/reading all older stuff as traditional stapled comics. 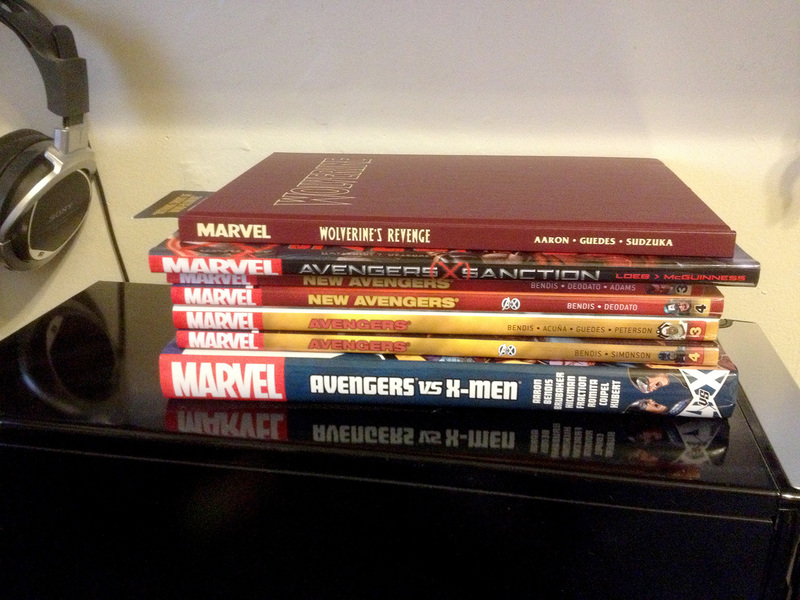 Altogether I have (as of right now) 1,200 comics yet to read. I can usually find the time to read about 3-5 a day. Sometimes more sometimes less. Lets use 5 as an average. At that rate it will take me 240 days to complete. The better part of a year. Now that doesn’t sound so bad on its own. But that is assuming a static number of unread books. That is simply not the case. I have so many unread boxes because I have runs/series that I am still collecting and I don’t plan to read through until I complete finding/buying them all. Those figures also don’t reflect some of the very prolific writers I tend to buy/read most of what they put out like Brian Michael Bendis for example. That guy writes books faster than I am reading them! Hmmmm…..after re-watching this I feel compelled to point out that my wife is NOT in the slightest bit like the shrew married to poor Henry Bemis! In fact she supports ALL of my hobbies and treats me much better than I probably deserve on balance.